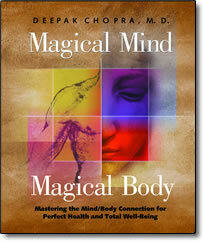 Magical Mind Magical Body – by Deepak Chopra – Discount! With Magical Mind, Magical Body, Dr. Deepak Chopra helps listeners uncover the healing power of the mind and utilize the power of quantum healing to gain a perfect balance of mind, body and spirit. Dr. Chopra shows you how to reconstruct the blueprint of your body so that you can enjoy perfect health, higher levels of energy and vitality, and enhanced inner peace. This revolutionary approach tells how you can achieve these results through the power of your mind. Chopra explains the “quantum mechanical body”–a level where thought is turned into physical reality. He tells you how to harness these new insights to make your cells think, and your thoughts move healing energy. In doing so, you will create the kind of health and mental state that you desire.